Dame Jocelyn Bell Burnell is coming to Exeter! Dame Jocelyn Bell Burnell, the astrophysicist recently awarded the Special Breakthrough Prize in Fundamental Pyhsics, is a role model and champion for young students and particularly for women in science throughout the world. Best known for her discovery of pulsars — rotating neutron stars that appear to ‘pulse’ since the beam of radio waves they emit can only be seen when it faces the Earth. Her observation, made together with her supervisor, Antony Hewish, is considered to be one of the greatest astronomical discoveries of the twentieth century. How to get involved: If you’d like to bring your sixth form students along to this free event, please email events@exeterms.ac.uk by Thursday, 28th February to let us know how many tickets your school will require along with whether you have any special access requirements. Target Audience: students from Cornwall, Devon, Dorset and Somerset that stand out for their achievement in and/or enthusiasm for physics. Aim: to provide students, that might otherwise be isolated, with a community of like-minded peers to explore challenging and interesting physics. Following the success of Exeter Mathematics School’s Maths Student Community, EMS began a Physics Student Community as of September 2016. The aim of our PSC-SW is essentially is to bring together and inspire able physics students from across Cornwall, Devon, Dorset and Somerset, forming a community of learners who will work together, share ideas, attend masterclasses and receive mentoring; delivering a fascinating insight into the exciting field of physics! Teachers frequently identify students within their settings who stand out from the crowd and who can find themselves working in isolation. Our aim is to bring these students together, to enable them to work with peers who are similarly able and motivated, to provide stimuli which will deepen and broaden their appreciation of physics and its related fields and to demonstrate how physics relates to their lives. It is our intention to support students throughout their secondary school career, regardless of whether or not they decide to apply for a place in our 6th form. We are pleased to confirm that we will be continuing the PSC-SW for students in Year 8 through to 11 in the 2018/19 academic year. If you have been part of the PSC for the academic year 2017-18 in Years 8-10, you will automatically be moved up into the next year group. Update paperwork will be sent out in the second half of the summer term. Nomination forms for the new Year 8 PSC 2018/19 have been sent to schools. Students nominated will attend a series of enrichment days at EMS. During the classes, students are introduced to Physics beyond the normal curriculum and are encouraged to think about, debate and explore challenging concepts and ideas. 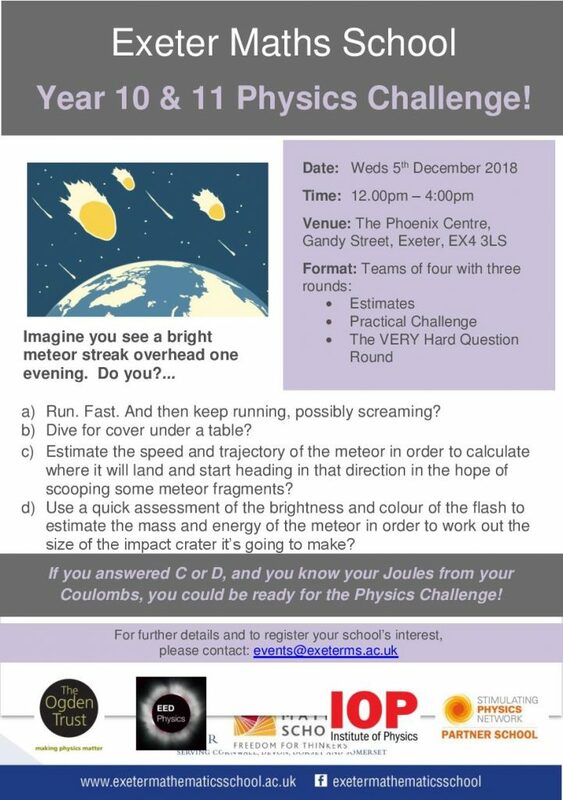 Target Audience: students within reach of Exeter that have the potential to reach an 8 or 9 in their GCSE physics but need some additional support or inspiration to do so. Exeter Mathematics School offers a GCSE enhancement course for able Physics students in Years 10 and 11 for the academic year 2017/18. Students who are nominated should be capable of achieving an A*, but should be those that would benefit from additional support and inspiration to do so. Students will have the opportunity to work with EMS staff to develop their academic skills and support their progress towards A* grades in their GCSEs. During a series of workshops and group sessions, students will have the opportunity to develop a deeper and more connected understanding of GCSE content. Supported by EMS staff, students will be provided with the stimuli to broaden their application of Physics and its related fields, whilst encouraging their development as problem-solving physicists; thereby preparing students for further study of Physics. If you have been part of our Year 10 enhancement programme you will automatically progress into next year’s Year 11 group. Nomination forms for the new Year 10 cohort for the academic year 2019/20 will be sent to schools later in the academic year. If you require a copy of the nomination paperwork, please email events@exeterms.ac.uk. Lessons will run from 1600-1730 approximately 14 times over the year. Dates for 2018/19 will be finalised soon. Please note that by joining the community, students are committing to attending all of the sessions outlined. Aim: to have fun, be challenged, enjoy Physics in a buzzy environment! If you’re an A Level student looking to test your Physics skills and knowledge, then the KS5 Physics Challenge is the place to do it! There will be an estimation round, a practical challenge and a very hard questions round – noting that year 12 and 13 content will be covered. We would like to invite teachers to nominate up to two teams to take part in the challenge and up to two reserve teams. Please note that students will need to be accompanied by a teacher on the day. Click here to sign up your team(s)! How to get involved: Email events@exeterms.ac.uk. Taster sessions being held in local schools early November – please get in touch to book a time. All workshops will run from 0900 to 1630 at EMS on: Saturday 9th March, Saturday 30th March, Monday 8th April, and Tuesday 9th April. Students will be provided with lunch and refreshments at each workshop. In addition to the four workshops at EMS, Isaac Physics provide weekly online video tutorial support for all students on any Ogden Isaac Programme to offer assistance with assignments that have been set by their Ogden Isaac Tutor. Exeter Mathematics School, Rougemont House, Castle Street, EXETER EX4 3PU. There is no cost to the students. This project is entirely funded by the Department for Education via Isaac Physics. Click here to visit the Isaac Physics website and book your place!